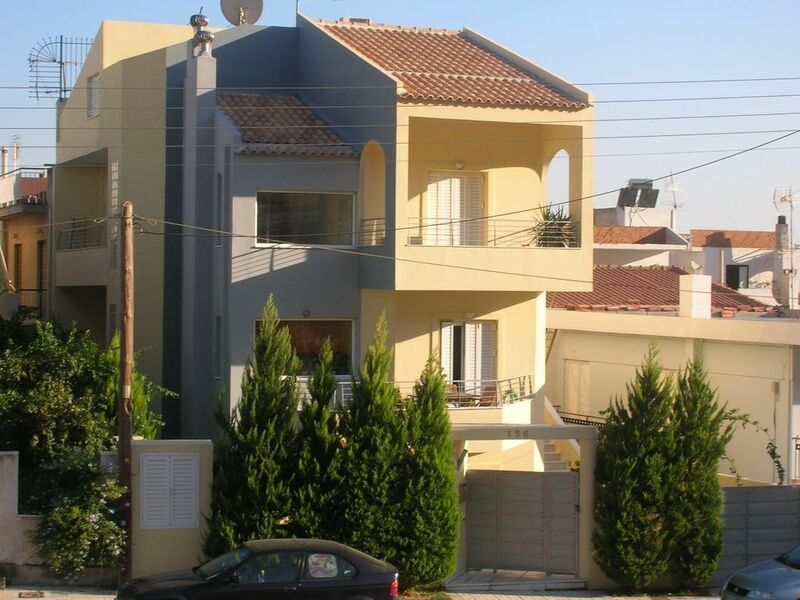 A luxury, vacation rental in Athens Glyfada, close to beaches, in a quiet area. This vacation rental is the ground floor of a recently built, three storey family house. It is modern, neutrally decorated, with 2 bedrooms, kitchen, living room and a bathroom. The total living area is 80 sq. m., it is suitable to accommodate up to 5 people. There is a private yard in arrears with outdoor furniture. Four banana trees are shadowing the yard. In the front side of the flat there is a garden with grass and a BBQ. The apartment is fully equipped and furnished. Contact for special rates for more than 10 days stay. Feel free to call for any information. We stayed at Giorgos' house in October 2010 and we were very glad that we did! The house had pretty much everything that we needed and it was big enough for 3 adults and a baby. It was also quiet enough for our baby to be able to sleep comfortably. Giorgos was very professional too, showing us around the house when we arrived and checking a couple of times through our 10 day stay to see if we needed anything. He never imposed but always welcomed us to knock on his door (he lives on the floor above) if we ever needed anything. The house is in a nice area with local shops (bakery, tavern, etc) just two minutes walk away, but if you want to explore further you'll most probably need a car. Glyfada centre is a couple of miles away and there you have a lot more shops of all kinds, many restaurants, taverns, fast foods, coffee shops, clubs and it also has good links with Athens. All in all, we had a great time and we'll definitely be going back. We can't recommend it highly enough. When we arrived at the accommadation we were met by the owners representative as they were away until the next day. He was a very nice young man who explained and showed us the appartment. It was very clean and as advertised. The next day we met the owners who helped us hire a car and were very nice and friendly. Their knowledge of the English language was excellent. The rooms were of a good size and the beds comfortable. Water was always hot and all conveniences worked well. There are local shops within easy walking distance even for 'old crocks', a frequent bus service to catch the Metro to Athens. You have to buy a ticket for the bus in a local shop costing 1€ but that can be used on the bus and also the Metro, so to go to Athens costs only 1€ for the complete journey. If you are over 65 it only costs 50 cents. We found everyone extremely friendly and we enjoyed our stay and definately will come to Greece again. Our only regret is why didn't we visit Greece before. Nous avons louer cet appartement deux semaines en Aout 2009. Tres bon accueil du proprietaite, tres sympa et discret. Appartement tres bon etat, calme, frais(important au mois d'aout). Proche d'Athenes, a 15 mn en voiture de la mer. Supermarche Carrefour a 5mn. i was in Georges apartment for 8-9 days. Very well equiped and comfortable. Best thing was cleanliness nd no noise. I definitely will stay again in the same property. We stayed at the flat from March until May 2009. We originally planned to stay there for one month only while we were looking for another flat. The fact that the flat was so comfortable made us take our time in finding a new place and we ended up staying a lot longer than we originally planned. The flat is spacious and clean. It is decorated in a modern and neutral style. Its biggest advantage is that you can arrive there with your suitcase only. It has bed sheets, towels, pillows, blankets and a fully equipped kitchen complete with all the utensils and cutlery and crockery, which is very helpful. All the electrical appliances are in good order. It also has Internet connection and a TV and DVD player. Effectively it’s like staying in a hotel but with all the comforts and space that a flat provides. The flat is a five-minute walk from all the local amenities and shops including a pharmacy, mini-market, bakery, hairdressers, restaurants, book shop and coffee shops. It is also five minutes away from a bus stop from where you can get direct buses to Peiraeus and central Glyfada where you find the closest beach, lots of restaurants and a shopping centre. The flat is very quiet and is located close to a mountain, which is ideal for taking long walks. George and his wife are very welcoming and happy to help with any questions regarding the area. Comfortable, well equipped, decorated in good taste. Everything 'works' - you just arrive with your suitcase and everything you need is there. This is the exception here, as we have since discovered. It was the first place we stayed in upon our arrival in Greece. The house is located in the upper side of Glyfada. It has easy access to both seaside and city centre. The visitor can easily access a “blue flag” sandy beach with in 2-3 km distance, enjoying all kind of facilities in organised beaches like summer sports, sun beds, umbrellas, beach bars etc. Some kilometres further along the coastline, towards cape Sounio, one can find fantastic picturesque places to enjoy swimming. The historic centre of Athens (Acropolis, Plaka) in not more than 15-20 minutes away.